Pork and fennel is one of my favourite sausage flavour combos. So no surprises that it also translates to a tasty burger! The other thing I love about this dish is the layering of fennel seeds with the fresh fennel in the salad. 1. In a bowl combine pork and fennel seeds. Season and form into 2 patties. 2. Heat a frying pan on a medium high heat. Rub burgers with a little oil and cook for 4-5 minutes or until no longer pink in the middle. 3. Meanwhile combine lemon with 2 tablespoons extra virgin olive oil. Season. Shave fennel using a mandolin or sharp knife. 4. Toss shaved fennel in the dressing with the rocket. 5. Place cooked burgers on 2 plates. Top with salad and drizzle over the mayo. 5-ingredients – skip the rocket (arugula) or fennel seeds. vegetarian – add fennel seeds to these chickpea burgers. egg-free – use natural yoghurt instead of the mayo or use a commercial vegan mayo. 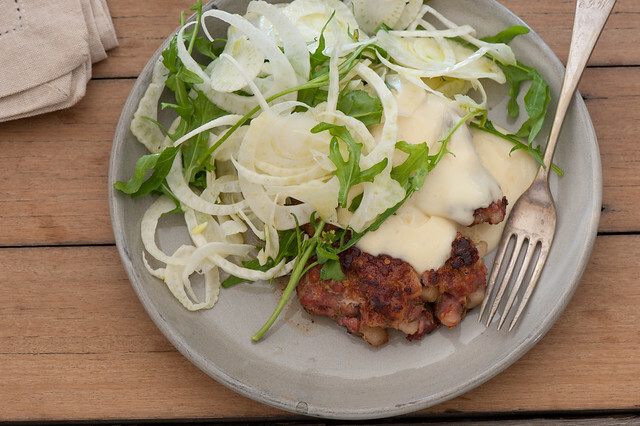 no fennel – replace with 2 small zucchini or just use more salad leaves. different meat – chicken, turkey or even beef are all good. more substantial – serve on burger buns (and fries). no fennel – just skip it. Or replace with some fresh red chilli. pescetarian – use finely chopped fish or cook fish fillets with the fennel seeds and serve with the salad and mayo. more veg – serve with a green salad. This isn’t related to the post, but you know a lot about nutrition and the latest research and I was wondering if you could help me. I have a six-year-old daughter who really likes having an overview understanding of things. She’s been asking questions about diet and nutrition, so I’m trying to put together a basic summary for her: these are the things your body needs and how your body uses them. (She eats a healthy diet, she just wants to understand it) I’m totally confused about how the body processes sugar vs other carbs vs fat. What would you say to a child? try to get the documentary on sugar called : “that sugar film”…. you”ll find loads of info and you can watch parts of it with your smart kid!